The Task: To meet the power and water needs of Jubail Industrial City, Saudi Arabia, the largest industrial city in the Middle East. 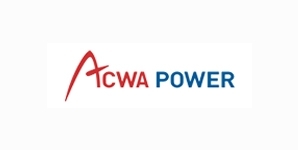 The Solution: ACWA Power International and other shareholders developed the largest integrated power and water desalination facility in the world to meet growing demand at Jubail and the Eastern province cities. The primary fuel for the plant is natural gas, with diesel as a backup. 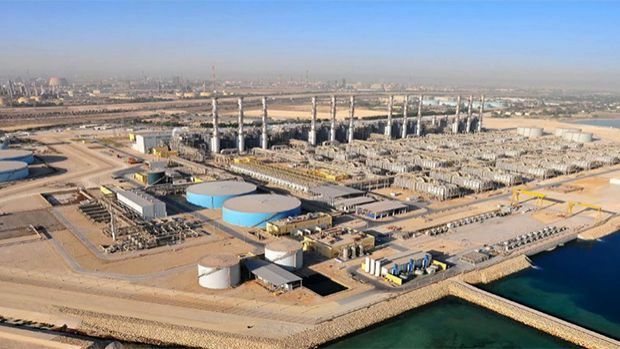 Each of the four power and water desalination blocks consists of three gas turbines and one steam turbine, forming a combined cycle and nine multi-effect distillation units. Excess heat from the gas turbine generators is fed into heat recovery steam generators to make steam, generating additional electricity to enhance the overall efficiency to over 60 percent, compared with 50 percent in conventional plants. Steam is also supplied to the desalination plant. The 27 desalination units use the latest multiple-effect distillation technology, which involves heating seawater to boiling point through multiple stages at successively lower pressures, producing vapour that is then condensed to form distilled water. The process optimises use of the thermal energy, delivering 9.85 tonnes of product water for each ton of steam. Jubail Water & Power Co. operates the plant. The entire power output of the plant is supplied to Saudi Electricity Co. Tawreed supplies 300,000 cubic metres of the daily water production to Marafiq for Jubail Industrial City. The Saline Water Conversion Corp. takes the remaining 500,000 cubic metres for the Eastern Province. The project won the 2007 EMEA Power Deal of the Year by Project Finance International, the 2007 Middle East IWPP deal of the year by Project Finance Magazine, and the 2008 Desalination Deal of the year by Global Water Intelligence.